It didn't take me long in my blog reading career to realize I truly disliked the "word verification." You know, the wacky words and letters that you have to identify in order to post comments to some blogs. The intent is to show that you have the ability to identify those letters, thereby ensuring you are not a robot. This is especially horrible when trying to make comments via a mobile device! I was so annoyed by the word verification on other blogs that I realized it must be annoying to my readers, too. 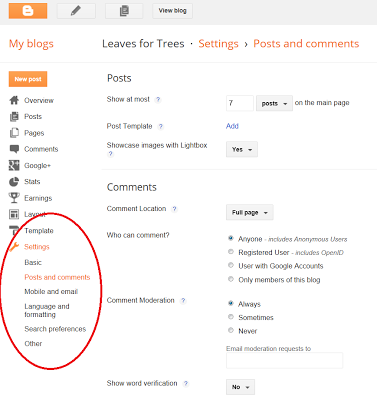 I dug in to the comments options in Blogger to find different ways to monitor my blog comments. 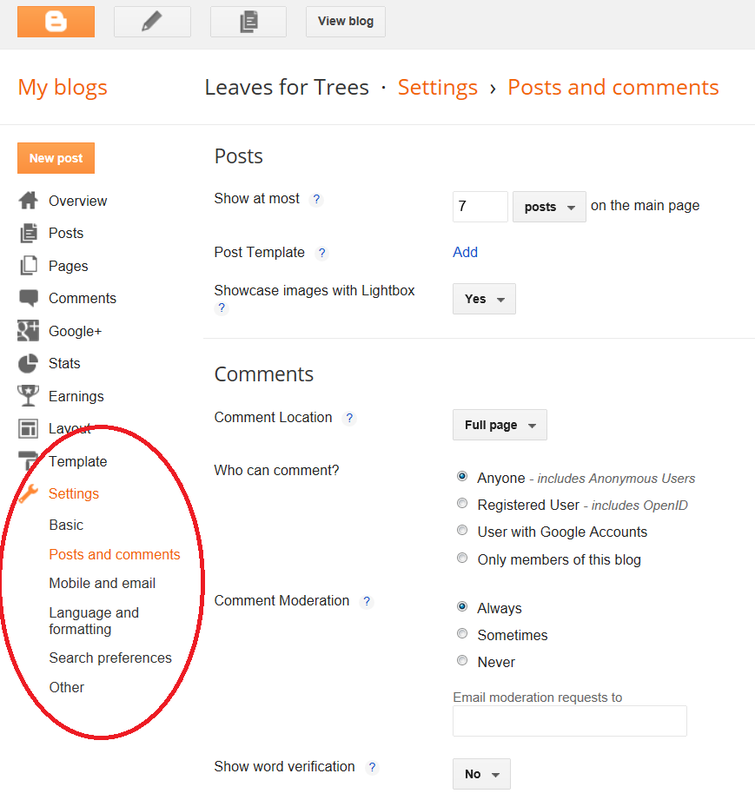 You can adjust the settings for blog comments by clicking on the Settings link on the left-hand side of your blog's overview page. Then click the link for "Posts and comments." 1. Full page - It opens a full-size page where the commenter can see the full post, other reader comments and a block for entering their own comment. I tested this option on my mobile and it defaulted to the embedded comment option, rather than changing to a full page. 2. Embedded - Opens a comment box on the same page as the post page. 3. Pop-up - Opens a small comment box in a separate window. I tested this option on my mobile device and it appears to default to the embedded mode, rather than open a new window. 4. Hide - The option to hide comments, though I'm not sure why you would want to! Under the comment settings you can also determine who is allowed to comment. The options include anyone, Registered user, User with a Google account and only members of the blog. Each option gets progressively more selective as to who can comment. I like allowing anyone to comment, that way I don't force someone to get an account they don't want just to make a comment on my blog. Of course, this means that "Anonymous" users (read: Spammers) are allowed to comment. The next option is comment moderation. This allows you the option to always, sometimes or never moderate comments. If you choose "always" or "sometimes" (for posts greater than X days old) moderate, the comments will be placed on hold until you approve them for posting via your Blogger homepage. I have mine set to always moderate which means no spam comments make it to my site (and therefore my readers that are following comments). This also means that I never miss a comment. It is a little more work, but I hate spam! Last, but not least, is the Word Verification option. I'm sure you know how mine is set! You can choose yes or no for this option. Choosing no means that it is easier for spam comments to make it to your blog. However, you can circumvent this by always moderating comments. What options do you like for comments settings? Heather, great tip! I also hate the wacky words and got rid of them a while back. I got an email from someone a few months ago that said she couldn't comment on my blog since she didn't have one of the account types listed. I opened it up to anyone with no moderation and found that most, but not all of the spam was caught. I do not use word verification because I am usually not a target for spammers. In fact, for a long time I allowed any and all users, even Anonymous. Blogger has been good about catching spam. However, here recently my spam count has gone up even though it's there in the spam folder, not where people can see it. So I went to Comment Moderation for posts more than 5 days old. That really helped catch the spam because usually the spam was on very old posts, and it was annoying to trace back very far to delete them. A couple weeks ago I started not allowing Anonymous users and that has eliminated the spam altogether. Once again we are all on the same page! ;) Wendy and Kathry, that is a good point about spammers posting on older posts. I can't think of what blog it was now because I deleted the emails, but I followe posts on one of my favorite blogs and I continue to get 2-3 emails a day from the "anoynmous" spammers that are hitting the blog post. It's pretty annoying. I dislike the word verifications too. I moderate all of my posts because of all the spam posts that are out there. I get about 5 spam comment posts per week that are goofy advertisements with some strange wording and pointing to a website. They appear to be scams and I don't click on the link and instead move them to the spam folder and then delete them. A very useful article. I too dislike word verification, especially as I do not have good eyesight. I never realised for a long time that my blog was set up to use it, until a kind fellow blogger advised me to abandon it. Recently I have been bothered much more with Anonynmous comments - the first time I was almost taken in with the flattery on my site - until realisation clicked. I now have comments moderation set up and hardly any do reach the published stage. Goodness knows what is in the spammers minds when they indulge in this. Thank you, Sue! I am also really annoyed by anonymous comments. I'm getting a ton now that my blog is pretty old. Luckily, most of them get caught as spam by blogger but I still have to delete 4-5 a day that get through. Annoying!